This Pakistani Jawan Hurt a Little Child Inside his School And he Proves Black Sheep Are Everywhere! There are many in this world who abuse their power in a wrongful manner and this upcoming story we are about to tell you is the same. Have you ever heard a grown man beating a child (not of his own) because the kid got into a fight with his child? This is what Pakistan army jawan Major Arbab did. Sources reveal that Major Arbab’s son got into a childish fight with Dr. Atif Faheem’s son; both kids who study in grade 3 of a private school located in Dikhan. The allegations made on Major Arbab reveal that the army official went to the school of his son, where he started beating Hassan in the school playground. 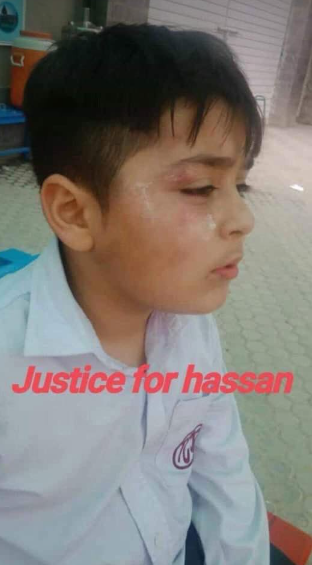 Not a single worker from the school came forward to save Hassan from the brutal beating of Major Arbab. All of this over a fight between two children? This is alarming. How can a school allow someone to beat up someone else child like this? Is it because the culprit is a serving major so he can just walk into school & manhandle someone else child, involved in a brawl with his son, while the school looks away? How can a school allow someone to beat up someone else child like this? @OfficialDGISPR Sir plz take a notice of this incident & make an example of him so that other people can't point fingers on our armed forces. His name is Major Arbab from dera ismail khan..
Army is there to protect the civilians but in this case, the opposite happened. Let’s hope that we find the truth behind this story and the army takes actions against whoever breached basic human rights here. On the other hand, you are a brave kid, Hassan! Latest Islamic Fatwa Says Using Somebody Else’s Wi-Fi Without Permission Is Haram! This Indian Woman Came ‘Saath Samandar Paar’ To Marry A Pakistani And Embrace Islam, Couple Goals! 9 Types Of Martyrs (Shaheed) In Islam And Here Are All The Details You Need To Know! Scientists Examine Quranic Claims Of Black Holes Discussed In The Quran 1400 Years Ago And Wow! This New Ritual Of A Man Praying Next To A ‘Daig’ Is An Addition To All The Weird Religious Rituals In Pakistan! Meet Salma Marwat Khan – Pakistan’s Fastest Emerging Female Rally Driver Who’s Touching The Skies!